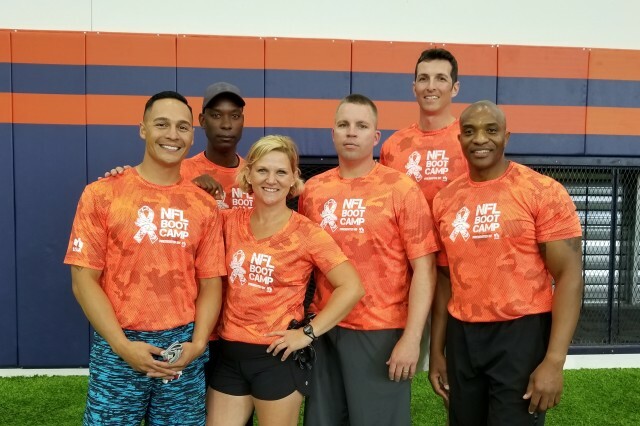 ENGLEWOOD, Colorado -- Fifty service members got a taste of the NFL as the Broncos and USAA teamed up for an NFL Boot Camp experience July 31 at the Denver Bronco's University of Colorado Health Training Center Fieldhouse in Englewood, Colorado. A five-person team from U.S. Army Space and Missile Defense Command/Army Forces Strategic Command competed against nine other service member teams in a football-themed skills contest to include team ball passing and catching, a gauntlet, the 40-yard dash, the vertical leap, and the three-cone shuttle. Team SMDC, which consisted of Maj. Michelle Kelly, Capt. Nathaniel Hoekje, Capt. Derrick Williams, Sgt. 1st Class Christian Budeshefsky, and Sgt. 1st Class Brian Picklesimer, worked together to take second place in the competition. Command Sgt. Maj. David Williams, command sergeant major, 1st Space Battalion, 1st Space Brigade, said the group worked hard in training for the event. "The team did an excellent job collectively at representing the 1st Space Brigade and the command," Command Sgt. Maj. Williams said. "Their dedication and commitment was outstanding as the team members got together Saturday, prior to the event, using their free time in order to work on their skills. Each team member put forth 100 percent effort in every event in the hopes of bringing home a win. In fact, they recorded the fastest time of the day for the passing event and broke that record on their final attempt for the day. It was great to see them in such good spirits throughout the day, and I believe it was a great experience for everyone. The command should definitely be proud." Capt. Williams said he loved the experience. "I really enjoyed the opportunity to compete against fellow service members during the Broncos Boot Camp," he said. 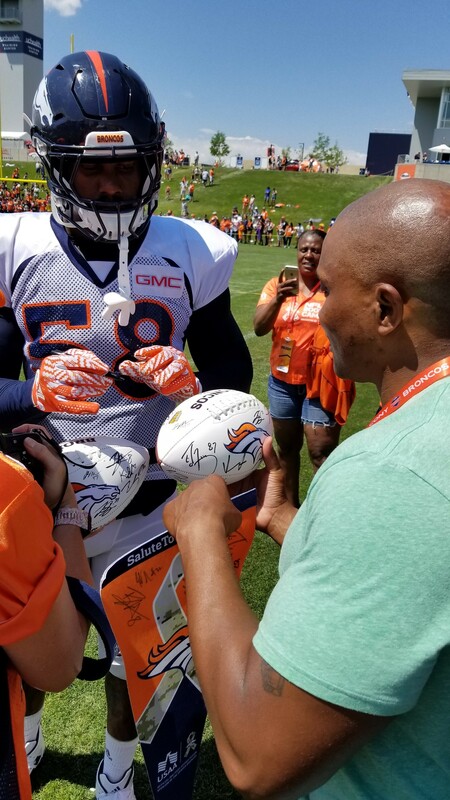 "I was fortunate enough to participate last year, and I must say USAA and the Broncos once again put on a wonderful event. The drills were very challenging and allowed us an opportunity to see what NFL players go through at the NFL Combine." 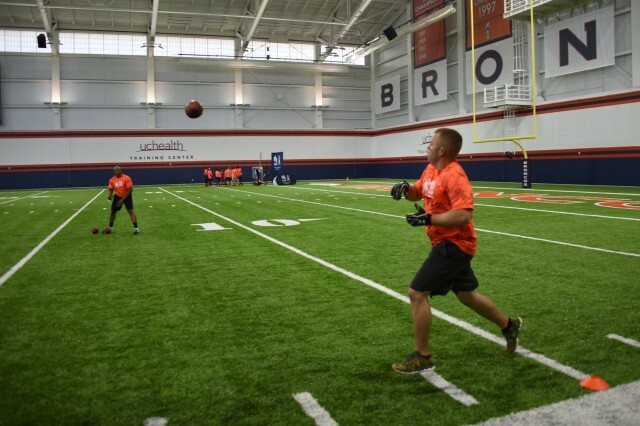 Following the competition, the service members were provided lunch and VIP access to watch the Broncos practice. 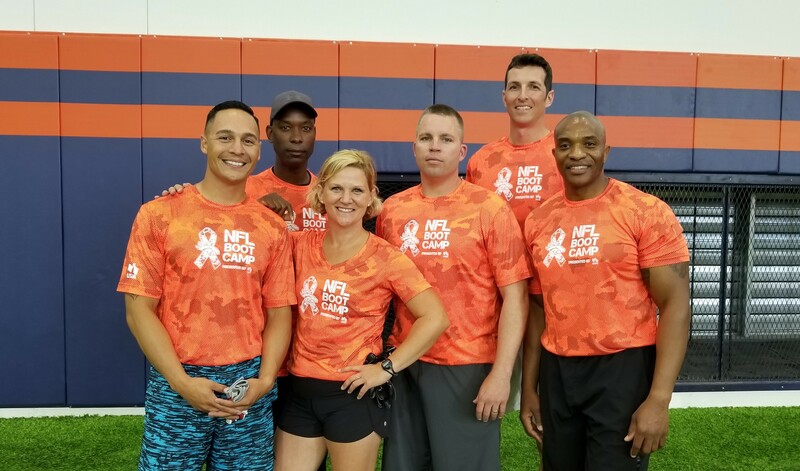 "The treatment we received following the boot camp was amazing," said Capt. Williams. 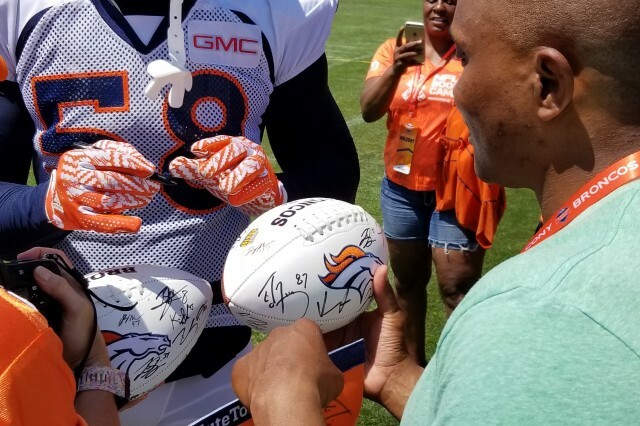 "After watching the Broncos practice, we were escorted to a private area for autographs and an opportunity to meet players from the team. The players were great, and expressed genuine appreciation for what the military does for our country."